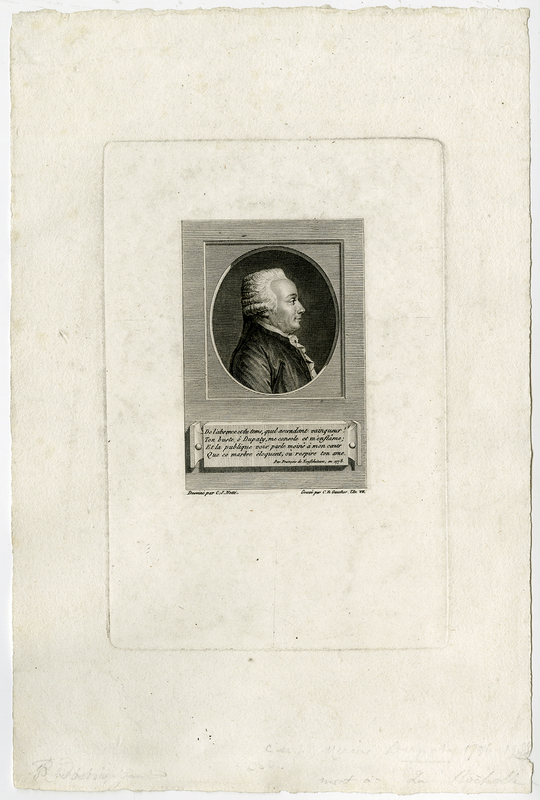 Subject: Antique print, titled: 'De L'absence et du temps, quel ascendant vainqeur! Ton buste, o Dupaty […].' - Portrait of the author and law reformer Jean Baptist Mercier Dupaty. Condition: Very good, given age. Large margins, faintly soiled. A crease in the top right margin corner. Pencil annotations in the lower margin. General age-related toning and/or occasional minor defects from handling. Please study scan carefully. Size (in cm): The overall size is ca. 16.6 x 25.2 cm. The image size is ca. 11 x 16.4 cm. Size (in inch): The overall size is ca. 6.5 x 9.9 inch. The image size is ca. 4.3 x 6.5 inch. Artists and Engravers: Made by 'Charles Etienne Gaucher' after 'Claude Jacques Notte'. Charles Etienne Gaucher (1741-1804) worked in Paris. He was a pupil of Basan and Lebas. Claude Jacques Notte (active ca. 1779-1795) worked as a portraitpainter.